Happy Black Friday, y’all! To continue my Holiday Gift Guide from earlier this week, today’s fun post is about what’s on my Christmas wishlist! I’m a huge lover of luxury so some of the things on my wishlist are a bit pricey, but hey, it’s what makes me happy! I hope you enjoy getting to know the kid-on-Christmas-Day side of me! Sony Cyber-shot RX100 Digital Camera – A blogging fact you may not know about me is that all photos you see on the blog and my Instagram is taken with my iPhone 7 Plus. Since I can’t afford a good camera (yet) and I am SO intimidated by DSLR cameras, I have found this camera (under $500) to be the one I want. I don’t like chunky cameras nor do I like complexity so I started researching affordable cameras this year. Aside from taking photos, I want to use it to vlog more often. After much research and tons of 5-star reviews, this baby is staying on my list until I can get it in my hands! Rose Gold APLs – Need I say more? It’s my dream luxury sneakers and I would squeal like a little girl if Santa put this under my tree! Limited Edition Armani Pivoine Suzhou Soie de Nacre – I tested this fragrance last month and I loved it. I can’t say enough about it. Armani is one of my favorite luxury beauty brands (aside from Chanel and YSL) and this baby has got to be in my stocking this year! Gucci Belt – This year, I decided that I would make wiser choices in terms of accessories for the rest of my life. I’m tired of spending money on accessories that don’t last long so when my bank says it’s okay, I’m investing in a beautiful belt that I know will take even the simplest outfits up a couple of levels. Simple Human Rose Gold Mirror – I’m dying for this mirror, y’all. Dying. My neck has been hurting a lot lately since I lean over my bathroom counter on the balls of my feet to do my makeup. I need this mirror in rose gold, stat. Louis Vuitton Pochette Metis – If you’ve noticed, I’m a huge fan of crossbody bags. I like my hands to be free of carrying a bag most of the time and this is the ultimate bag I’ve been lusting after for a little over a year now. Knowing that it’ll fit my phone, wallet, keys, lipstick, a small camera and more makes me so giddy. It’s a bag that will never go out of style. Marc Jacobs The Face Foundation Brush – I’ve been applying my foundation with a Beauty Blender, but have realized that I’m wasting a lot of product doing so. Investing in this foundation brush may be the answer to saving more money in the beauty department for me! Diptyque Candle in Baies scent – I love, love, love Diptyque! Ever since I scored a small candle set during the Nordstrom Anniversary Sale, I’ve been burning my candles at a slow pace because I don’t want to go through them too fast. So far, Baies is my favorite scent! Ear Crawlers – I lost my ear crawlers I got at Altard State a few years ago, so I think these are a great replacement! Subtle, yet special. Silver and Rose Gold Watch – Currently, the only watch I own is a rose gold Michael Kors. However, I stopped wearing it because it was too heavy (it’s the chronograph style) and since my favorite silver Timex broke, I haven’t worn a watch since then. I saw Lydia show this watch on her YouTube channel and liked it so I’m adding it to my wishlist! MAC Lip Pencil in Soar – Going through my makeup, I realized that I didn’t have a neutral lip liner. Actually, I only have one and it’s a bright fuschia color. Obviously, this neutral lover needs a neutral lip liner (and a couple more neutral lipcolors). I also want this lip pencil in the Spice shade. Tell me because you know you want to!!! 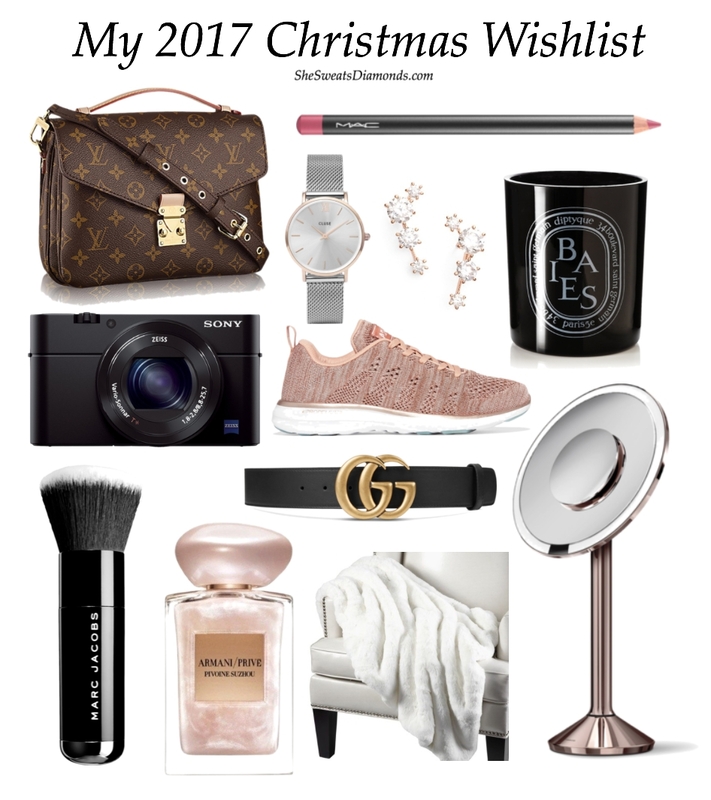 What’s on your 2017 Christmas wishlist?! Happy Friday, y’all! I hope you’ve enjoyed time with your loved ones this week! May your bellies and shopping bags be full! 2 Replies to "My 2017 Christmas Wishlist"
You should!!! I’d love to see what’s on your wishlist!